Exosomes are extracellular vesicles released by many cell types and have been attributed for their roles in many diseases including cancer. Exosomes secreted by tumor cells and stromal cells are critical mediators of intercellular communication in tumor microenvironments. Long noncoding RNAs (lncRNAs) are selectively sorted into exosomes and can regulate cancer onset and progression in a variety of ways. 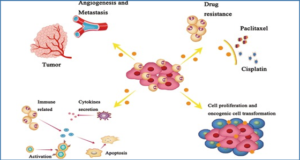 Researchers at Zhengzhou University summarize the characteristics of exosomal lncRNAs and their dysregulation in multiple types of cancer. 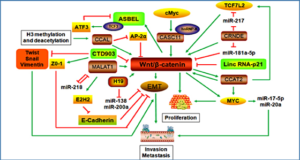 They provide an overview of current research on exosomal lncRNAs in tumor microenvironments, especially the functions of exosomal lncRNAs in regulating tumor biology. A deeper understanding of the role of exosomal lncRNAs in the tumor microenvironment may help provide new diagnostic and prognostic markers for cancer.